It was not very long ago, about 10 years to be precise, when i used to go to a nearby “cyber internet browsing centre”, to battle online on Orkut. It was fantastic that you could connect with someone remotely and display your skill. It was even more amazing when people recognised you based on the identity that you created online. However, people move on with their lives, very few actually were persistent in the Hip Hop underground. There were no one to look up to, no rappers that existed before to advice you on what you have to do, no foot prints to follow. At that time, I saw a very young artist emerge out of Bombay, who was massively focused on lyrical skill more than anything else. He was proud of it. His name was Poetik Justis. Years afterwards, today, Hip Hop has 2 generations of rappers preceding it. So many artists dropping their mixtapes/albums, its a revolution I have been waiting to see. Come to think of it, its a revolution that displays a huge rise in the quality of product or music brought out by Indian artists. The time is now. Its time to be great. 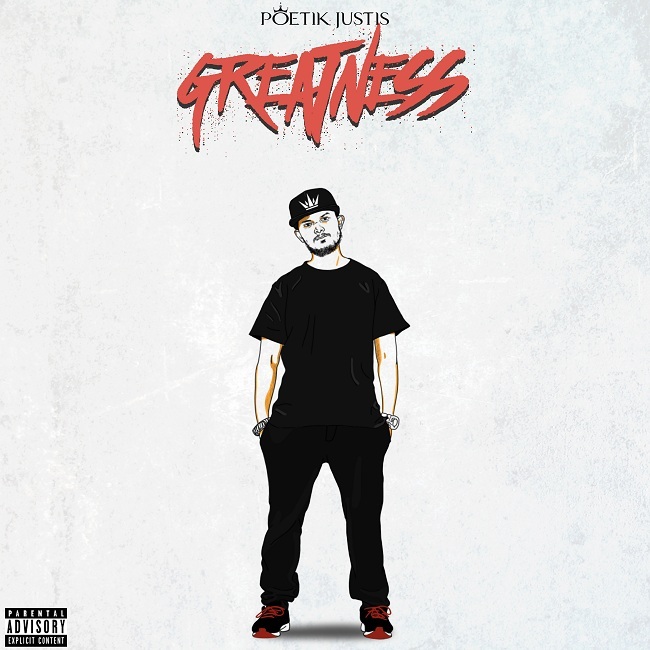 Poetik Justis dropped his album on 18th December titled GREATNESS. The name honestly got me curious, I sat through it for a few days carefully reviewing tracks. I am usually super critical of Indian rappers cause they tend to compromise on either quality or content. As soon as i put out the first track i knew, Poetik Justis had not changed, Poetik did what he thought was right. He was not lying on these tracks, he was truthful and it came out of his heart. Thats important for me, as a listener, I can tell when an artist does not mean what he says. The beautiful mixture of Hindi and English was very important to me, he did not side towards one language. He did both. Thats critical for a genre, we are bridging the gaps for 2 sets of audiences. Each song in this beautiful album has been handcrafted to perfection. I am not even going to praise poetik for his lyricism, that’s something i expected. The flow is always on point in the album. Overall its lovely how the transitions between songs too, every song has a connection with the one preceding and succeeding it. How many rappers can do that? rather… How many rappers can do that confidently? The answer is few… very few. All in all, for me, this is the best album that has come out this year in Indian Hip Hop. Its complete and beautiful, the video for Baari Music is something i will be watching close. For a conscious rappers like Poetik Justis, its exciting for me to see how he was grown in this game. It is also something I am truly proud to witness from its very birth. For more GREATNESS to all rappers in India. Smokey: Whats the Idea behind the name greatness? Poetik: I wanted to encapsulate a lot of things, not just greatness for me, but being great towards the people you know, the way you think and the way you act towards the world you live in and people that surround you. Smokey: U have been an MC in the Hip Hop scene for a long time now. We see a lot of rappers bring their mixtapes and albums into picture. How much does that add up to you in terms of competition? Poetik: In my opinion, right now in the Indian Hip-Hop scene, competition and collaboration go hand in hand, I feel that yes there should always be a competitive mind state but that doesn’t mean you shouldn’t push the other artists aside, we’re all we’ve got and we should see this as an overall Indian Hip-Hop perspective. Smokey: Most Instrumentals in the album have dope production. Who influenced the production in this album? Who was involved? Poetik: Most of these beats are 1 or 2 years old, they there was no single person influencing the overall production regarding the instrumentals, it was more like brainstorming for ideas from my side as well as the producers and in the end that worked out really well for Me. Smokey: What was the thought process behind how the album was shaped? What are common problems you faced? 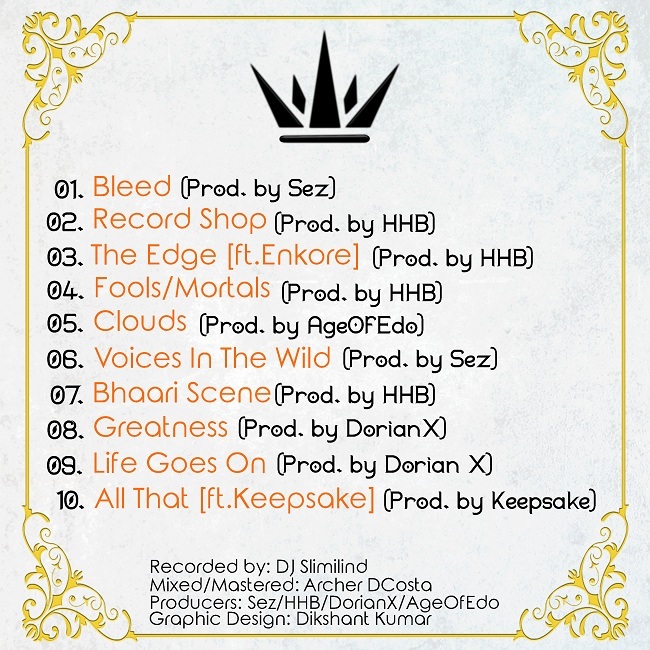 Poetik: The album is a collective of my most experimental works, as an artist who has found his sound, I felt I should push further into newer avenues to really see how far I can go, this album helped pave the way for that and I am glad it worked out the way it did. There were different problems at different points of time making this album come to life, the biggest one was putting it all together, in the way that each track had to sound in line with the next but also had to sound like a standalone track by itself. It’s a mix of a lot of styles and that’s one thing I had to get right throughout the album too. Smokey: I observed that there is a beautiful mix of Hindi and English in the album. How important is the portrayal of Hindi rap and English rap in this album? Poetik: I wanted to try my hand in writing in Hindi too. I feel it’s very important and about time I tried to cross over and switch between styles here and there. And like I said , that took a large amount of time trying to get done but all in all it went really well with what I was trying to do. Smokey: The whole album has a very proud sound to it. This is very different from what you conventionally do. Surely, no artist would want to remain the same but in terms of priority what components of constructing this album was most critical? How important was factors like lyricism?